I tell impactful stories about people, products, and services – and the value they bring to the world. "I’m a creative copywriter with a knack for brands, an eye for design, a digital mindset, and a passion for influencing people. Oh—and a sense of humor." Now here’s the real bio. I earned a B.A. in Journalism from University of Wisconsin at Madison (go Bucky). After realizing my first job might involve carrying a police scanner at 2 am in pursuit of “newsworthy” crimes, I decided I was better suited for marketing, advertising, and product writing. This was 2005—the beginning of the content strategy and digital content marketing phenomena—and I entered the space at the perfect time. I got my feet wet working at University of Wisconsin Health, churning out captivating, SEO-friendly digital content, and learning to build corporate websites. Over the last 10 years, I’ve written emails, blog articles, white papers, sales sheets, website content, social media posts, press releases, pitch decks, video scripts, podcasts, and more. You name the media. I’ve probably done it. Great writing doesn't happen alone. Here are my creative teammates. 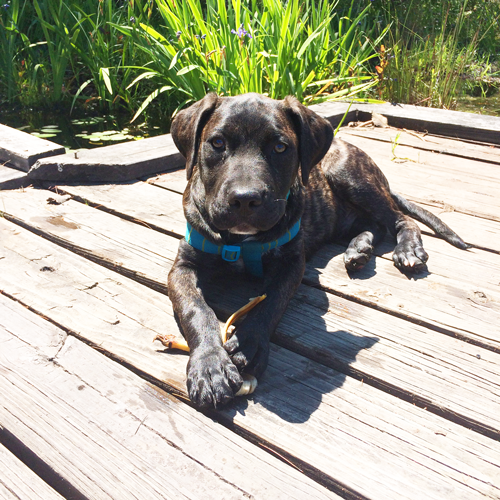 The newest addition to our team at EST Creative is Obi (short for Obi Wan Kenobi). He is a jedi-master at going behind my back to find things to chew. And, actually, that's the reason I haven't had time to finish his website bio. I'm busy chasing this puppy around and saying, "noooo Obi!" His new nickname is 'NoObi." Waggling my tail for treats.